This report summarizes and quantifies the estimated total lifetime emissions of crude oil from the former site of oil platform 23051 which was destroyed by Hurricane Ivan in September 2004. We believe this site has been leaking crude oil into the Gulf of Mexico ever since. SkyTruth began monitoring this site in May of 2010. 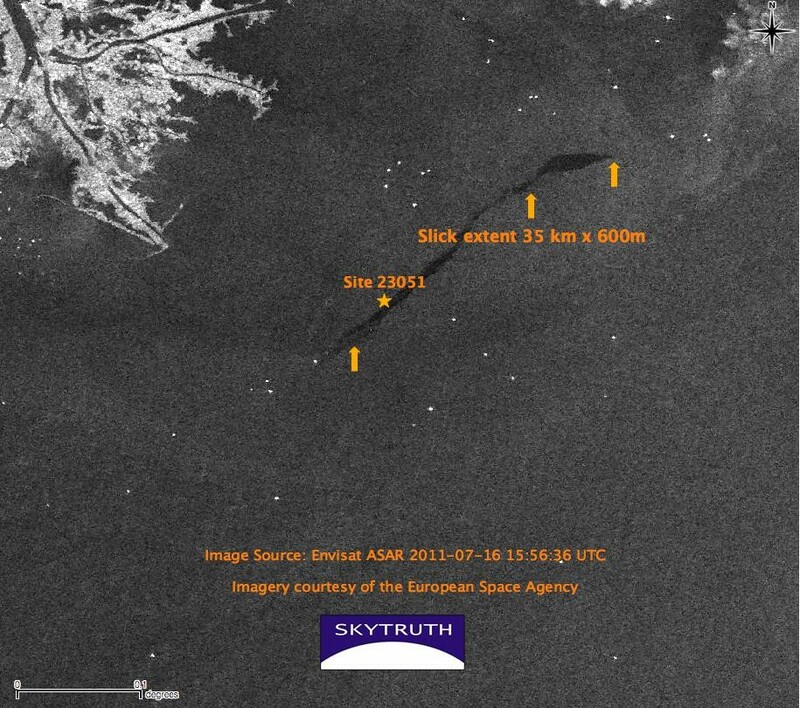 Since then we have accumulated a large body of direct observationsof the oil slick using current and historical satellite imagery as well as recent direct observations via overflights. We have also analyzed the thousands of pollution reports related to oil leaking from this site that were filed with the US Coast Guard’s National Response Center. We believe that we now have sufficient information to estimate the total emissions of crude oil to date from this ongoing oil spill. Based on pollution reports which we presume were filed by the polluter, and satellite images showing a slick present during the periods when there were no reports filed, we conclude that oil has been leaking more or less continuously from the damaged subsurface wells at this site since the platform was destroyed on September 17, 2004, and continues leaking to this day. Our approach was first to determine whether the documented spill events reflect a continuous spill or just a series of episodic spill events. By analyzing historic satellite imagery, the rather large gaps in the official pollution reporting record can be filled. Next we sought to estimate average daily slick extent (area) for each year from 2004 through 2011, and from that derive an average daily slick volume for each year using assumptions about the average thickness of the observable slick. This average daily volume tells us how much oil from this site was sitting on the surface of the ocean on any given day of the year. Next we made a further assumption about the rate at which oil degrades on the surface of the ocean, and from that derived the average daily flow rate that would be necessary to maintain a continuous oil slick equal in volume to the previously computed average daily volume. Finally, with an average daily flow rate in hand, we simply multiply the daily rate times the number of days in the year to get the annual total emissions. The sum of the totals for each year then gives us the lifetime total emissions (to date). Based on experience, consultations with experts and academics, and established industry standards, we assume that the minimum average thickness of an observed oil slick is between 0.5 micron and 1 micron (one micron = one-millionth of a meter). We assume that oil degrades steadily on the surface of the water according to a formula known as a “Half Life”, which means that however much oil there is on the surface of the water, half of it will degrade in a given amount of time. Oil degradation is caused by numerous effects such as dissolution, evaporation, biological action, photolysis, and natural dispersion through wind and wave action. Each of these processes produces its own rate of decay. We base our half life assumption on empirical observations of the aggregate effect of all of these processes, and assume that the average half life of a relatively thin oil slick on the surface of the water is between 3 and 7 days. Unfortunately the official record of pollution reports for this site prior to 2008 is almost non-existent. We only have satellite images covering this period, and we do not have enough of them available for analysis to use them as the sole basis for an estimate of average slick extent. However, we do have enough of them to confirm that the years prior to 2008 show regular slicks at the site. These observed slicks are comparable in size to the ones that we observe in later years when we also have corroborating official pollution reports. In our calculations, the average daily flow rate for 2008 is very close to the combined average for 2009-2011, so for the purposes of estimating a total lifetime emission, we assume that the flow rate in years 2004-2007 was the same as in 2008. The pollution reports used for our analysis come from the National Response Center – retrieved from their Query/Download Data web page. We downloaded all the reports for 2000 – 2011 and then filtered these reports to include only those that apply to the area of Site 23051 (Mississippi Canyon Block 20), and of those only the reports which contain an estimated oil slick (or “sheen”) extent (which was most of them) and also appear to have been filed by the polluter (there were a few reports that seem to have been filed by passers-by). This filtering left us with 950 reports covering the period from May 2008 through December 2011. In none of these reports did we find evidence of a chronic pollution source in the vicinity of this site other than the one in our study. In addition to a slick extent, most of the pollution reports contain an estimated spill volume. We decided not to use this amount because we believe that in most cases the reporter has no way to directly measure the actual volume coming from the multiple leakage points on the ocean floor at this site. Instead, we assume that the reporter is estimating volume using an approach similar to ours – based on the observed slick extent. Therefore, since the reported slick extent is the actual measurement that the reporter made, and we do not know what assumptions the reporter may have used to derive their reported volume, we use the reported slick extent exclusively to inform our own calculations. It is worth noting that the reported volumes in the NRC reports are generally at least 1 order of magnitude smaller than our calculations. Since we do not know how these numbers are computed we cannot speculate on the reason for the large difference. Visible light images (MODIS) are available for most days, but weather and illumination conditions (clouds, haze, fog, sun angle) restrict visibility on many days of the year, and the low spatial resolution of MODIS imagery means that smaller, narrower slicks are too small to see. Radar satellite imagery (ASAR) is not affected by clouds or solar illumination, has higher resolution and is excellent for viewing oil slicks on the surface of the water, but until recently we have had very limited access to this type of imagery. One result of the limited availability of suitable imagery is that we cannot observe the slick at this site on every day of the year. Consequently we cannot use the imagery alone to assess the total volume of oil being emitted from Site 23051. 1. Reported slick extents in NRC reports are corroborated by satellite observation. On the days when we can see a slick in the imagery and there is an NRC report, we find that the observed slick is usually as large or larger (sometimes much larger) than the reported slick extent. 2. On days when no report is filed, we observe slicks comparable in size to those on days when a slick is reported. Based on these considerations, we decided to use the slick extents as reported to the NRC for the days covered by a report, and to assume that slicks with the same average extent existed on all other days of the year not covered by a report. Further, for days in which there were 2 or more reports, we took the average of all the reports for that day. For simplicity and consistency, we do not use any slick extents derived from satellite image observations, only those stated in the official NRC reports. Explanations of the various computational steps follows. This value is derived solely from the NRC reports. For each report we multiply the reported slick length and width to get an area. For any day with more than one report in that day, the slick areas are averaged for that day. Then the average slick extent is computed for each year, based on every day in which there was a report. This value is expressed in square miles. Slick volume is computed by converting the assumed thickness for the scenario into a factor expressing gallons per square mile. This factor represents the number of gallons that would be contained in a slick covering 1 square mile at the assumed thickness. This factor is then multiplied by the Average Daily Slick Extent to get the Average Daily Slick Volume. Here we compute the average daily flow (leakage rate) that would be required to maintain a constant slick equal to the Average Daily Slick Volume, assuming that the slick has the half life given in each scenario (3 days or 7 days). This means we assume that the oil degrades at a steady rate such that half of it will be gone in the number of days equal to the half life, and the flow of new oil into the slick is equal to the rate of degradation, so that the slick maintains a constant size. In reality, the visible slick is changing from day to day as wind, weather and illumination conditions change. However, on average over the course of the year, a constant flow of oil from below will maintain a fairly regular average slick extent. Since we have concluded via satellite image observations that the oil slick is present at the site even on the days when no report was filed, we assume that crude oil was emitted at the site at the average daily flow rate for every day of the year. Multiplying the average daily rate by the number of days in the year yields the Cumulative Annual Emission for that calendar year. Finally, we add up the Cumulative Annual Emission for each year from 2004 through 2011 to get the Cumulative Lifetime Emission for each of our 4 scenarios.